A video tribute to five roller coasters at Kings Island Amusement Park in Cincinnati that did not stand the test of time. The Screamin' Demon was a shuttle loop roller coaster at Kings Island in Mason, Ohio. 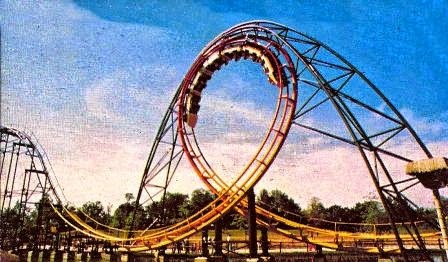 Designed by Arrow Development, it opened in 1977 as one of the first looping roller coasters in the United States to run both forward and backward. After ten years of operation, the ride was moved to Camden Park. Anton Schwarzkopf and Intamin AG co-developed the first shuttle loop design, which opened as King Kobra at Kings Dominion in 1977. A total of six shuttle loop roller coasters opened that same year throughout the United States. Screamin' Demon had the distinction of being the first from Arrow Development to open to the public. Unlike the vertical tracks used as reverse points at both ends on the King Kobra, Arrow used loading platforms instead. At the end of the 1987 season, the ride was sold and relocated to Camden Park in West Virginia where it was renamed to Thunderbolt Express. It was closed in 2000 and never reopened. It was eventually scrapped in 2004. After riders board a train in the loading station, they are launched forward into an immediate drop. The propulsion system consists of an electric motor and pulley system. The drop leads into a vertical loop as riders experience a maximum of 4-g. The train exits the loop and ascends to a horizontal section of track similar in length to the loading station. After coming to complete stop for a brief moment, the train in launched in reverse to repeat the course and return to the loading station.